What do I Heart Huckabees, The Shawshank Redemption, Cinderella Man and The Constant Gardner all have in common? They are all good if not great movies with bad titles. I don't want to elevate your expectations to Shawshank levels of good but I do want to let you that You're Next is far better than its bland title might lead you to believe. The film is essentially a straight forward home invasion story. A well to do couple is celebrating their 35th wedding anniversary with their four children at a remote vacation home/mansion. Despite being immediate family it is painfully obvious that this family is not close. Their exchanges are filled with insults and judgement that leave the audience feeling uncomfortable. Its like being invited over to your girlfriends house for dinner and her parents fight through the whole meal. You want to leave but the drama of the escalating tension is somewhat fascinating. 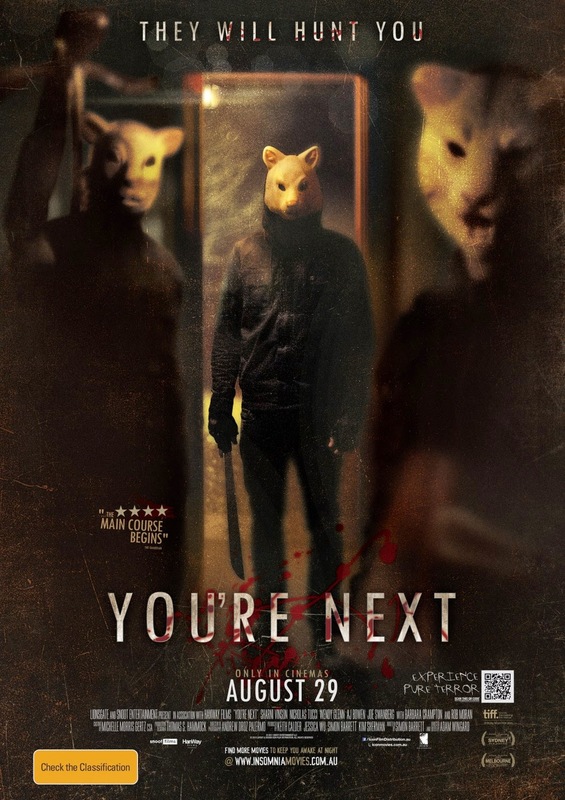 That's what makes You're Next stand out from other recent home invasion films like The Purge, this film is focused on character and tension more than gimmick. We are shown characters that would be interesting to watch even if they were not in the insane situation that Wingard has put them in. It seems simple enough but most genre directors and writers seem more concerned with jump scares and cleaver kills than character and story. Give us characters that we care about or at the very least are compelling and we will follow you to the end of the earth. Back to the film. Before the family can fight its way through its first meal of the weekend a group of "hunters" wearing creepy animal masks start offing members of the family one by one. The film has more than enough gore for for the most hardened horror fan but is clever enough to keep the rest of us laughing, screaming and most importantly wondering what will happen next. This is a perfect movie to watch with your partner on the couch with the lights off. Movies like this are the reason I keep going back to the horror genre. You have to wade through piles of really bad ones to find the gems but when you do... its what made me fall in love with movies in the first place. A completely engaging experience that catches me off guard, raises my pulse and leaves wanting to tell everyone I can about how great what I just saw was. I'm not going into the specifics of the story because if you haven't seen it, you should and the less you know about it the better.